If we had to pick one text in the entire history of philosophy to have you read, the Apology would definitely be it. The text has it all: a compelling hero (Socrates), a life and death situation (his trial), and one of the most eloquent statements about the philosophical life ever articulated (his speech). As you read the text, it will become evident that Socrates has very clear ideas about what the philosophical lifestyle demands of its practitioners. That Socrates was willing to face death rather than abandon his most cherished principles also demonstrates just how seriously Socrates took his vocation as a philosopher. Where does the dialogue open? What is Socrates waiting for? Why does Crito come to visit him? What "arguments" does Crito give to support the idea that Socrates should escape from prison? What does Socrates means when he says that the opinions of the many are irrelevant to how one ought to behave? Whose opinions does he think are, in fact, relevant? What is Socrates' convictions concerning doing wrong to others or returning one wrong for another? What specific arguments does Socrates give in justifying his position to obey the law that has sentenced him to death? How does the dialogue end? What does Socrates decide to do? 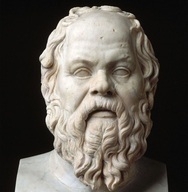 In the Apology, Socrates maintains that "the unexamined life is not worth living." And yet it seems to be the case that many - if not most - human beings live their lives without ever spending any time reflecting on the meaning and purpose of their lives. What are the implications are of Socrates' position? Why do you think he felt it was so important to be able to critically examine ones life? Socrates argues that the person who knows how little they know is wiser than the one who thinks hs knows it all. Does this position make any sense? Why or why not? In the Apology, Socrates argues that the good person need not fear death? Do you think that this is true? Why or why not? © Michael S. Russo, 2013. All of the content on this webpage is copyright. The materials on this webpage may not be modified, posted or transmitted without the prior consent of the author. Permission is granted to print out copies for educational purposes and for personal use only. No permission is granted for commercial use. © SophiaOmni, 1999, updated December 2018.